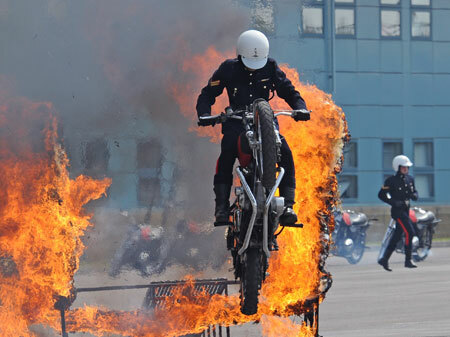 World famous, record-holding display team the Royal Signals White Helmets will headline the Wings & Wheels Stunt Zone this August Bank holiday at Dunsfold Aerodrome near Guildford in Surrey. The team of 30 volunteer soldiers from the Corps will perform spectacular feats of balance, death defying crossover rides and outstanding acrobatics in thrilling arena displays on handbuilt British Millennium Triumph 750cc motorcycles. The White Helmets demonstrate all the qualities needed in the modern Army – teamwork, courage, trust, strength and agility. This team has existed as a recognised organisation since the first public displays of joint precision horsemanship and motorcycle riding were given by instructors and students from the Signal Training Centre in Yorkshire in 1927. Recognised by many as the best in the world the Royal Signals Motorcycle Display Team has been performing for over 80 years. Visitors to Wings & Wheels can also enjoy the world famous Red Arrows, Battle of Britain Memorial Flight (Lancaster, Spitfire & Hurricane), Vulcan, Chinook, the Canadian Warplane Heritage Museum’s (CWHM) prized Avro Lancaster, B25 Mitchell and a host of other modern and historic aircraft during the five hour flying displays. For four and two wheeled fans, supercars and classic and vintage icons put on an awe inspiring display of power and speed on the Top Gear track in a two hour auto spectacular from Brooklands Museum. The Goodwood Festival of Speed air display took a new turn on Sunday, as the Midair Squadron Hawker Hunter XL577 set a flown time of 9.98 seconds across the notorious Goodwood Hillclimb in front of Goodwood House.As the first and only attempt of this kind, the Hunter, piloted by Squadron Leader Dave Piper (retired) reached a top speed 361 knots (415 mph), as he weaved his way to the top of the course. The driven record is held by Nick Heidfeld in a time of 41.6 seconds set in 1999 in a McLaren MP4-13-Mercedes Benz with an average speed of 104 mph, meaning the Midair Squadron’s time shaved 32 seconds off Heidfeld’s time – admittedly in a jet! Great Britain and Oman have enjoyed an enduring relationship for over 200 years that stretches back to a Treaty of Friendship in 1798. This broader relationship has been replicated in the close professional co-operation that has developed between the Royal Air Force and the Royal Air Force of Oman. 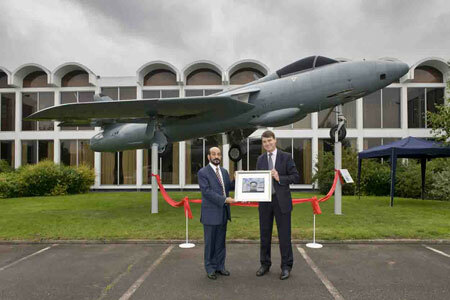 It is a relationship that continues to develop into the 21st Century with the Royal Air Force of Oman’s purchase of the Eurofighter Typhoon and the latest Hawk Advanced Jet Trainer from BAE Systems. Formed in 1959 from a nucleus of Scottish Aviation Pioneers and Hunting Percival Provosts, and manned by Royal Air Force loan officers, the Royal Air Force of Oman (originally named the Sultan of Muscat and Oman’s Air Force) has grown into one of the most capable air forces in the Middle East. This achievement has been supported throughout by mutual respect, friendship and encouragement between the Royal Air Force and the Royal Air Force of Oman. In a brand new exhibition, curated with the support of the Archives Division of the Royal Air Force of Oman, the Royal Air Force Museum tells the story of this enduring relationship through the experiences of officers and men, from the Royal Air Force, the Royal Air Force of Oman and British industry who have played an important part in creating a modern, professional and highly effective air force. The story will range from the Royal Air Force’s involvement in the Middle East from its formation in 1918 and includes highlights such as the visit of Sultan Taimur bin Faisal to Royal Air Force Hendon in 1928 as the guest of the British government to watch an Air Pageant as well as the vital support offered by Oman to Great Britain during the Second World War through the purchase of Spitfires flown by the Royal Air Force. Air Commodore Musallam Al-Zeidi, Royal Air Force of Oman: The outstanding and deep-rooted relations between the Royal Air Force (RAF) and Royal Air Force of Oman (RAFO) signify the close cooperation and mutual understanding between the two services in various fields in general and the field of defence in particular. Under the umbrella of this distinguished relations, the Royal Air Force has contributed greatly to Oman through providing expertise and technical knowhow to our personnel and we are sure that Royal Air Force will spare no effort in providing the requisite training which will put our fledgling Air Force in a good stead and enable it to keep abreast with the latest technological advancements. The close cooperation has carved a worldwide niche as unique relation and will continue to be so for years to come. Rafale multirole fighters from the French Navy will represent the sharp end of ‘Carrier Aviation’ at RNAS Yeovilton International Air Day on 26 July. Two Rafale Ms will be part of the event’s static display, joined by a Falcon 10 transport and communications aircraft in the French Navy’s only UK airshow appearance of this year so far confirmed. Following the naming ceremony for the Royal Navy’s first Queen Elizabeth-class aircraft carrier, which takes place on 4 July, Air Day 2014 has taken ‘Carrier Aviation’ as this year’s theme. Celebrating the triumphs of airborne assets deployed at sea since aviation’s earliest days, Air Day will host a large gathering of carrier-launched aircraft types. 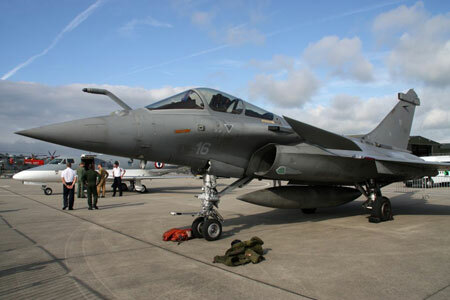 They include the Dassault Rafale M which has been in French Navy service since 2000. Equipped with a hardened airframe and toughened undercarriage, it is fast, extremely agile and able to simultaneously carry out air supremacy, interdiction and reconnaissance missions. The Rafale M is a definitive modern-day naval multirole combat aircraft. The Dassault Falcon 10MER is based on the 1970s-era Falcon 10 business jet. Operational taskings for this aircraft, seven of which joined the French Navy between 1973 and 1983, include training, electronic countermeasures, communications and transport. Other foreign air arms’ involvement in Air Day 2014 includes Belgium’s, Denmark’s and Jordan’s national display teams, the Belgian Air Component F-16 Solo Display and the Swiss Air Force F/A-18C Hornet Solo Display. Tickets for Air Day can be booked online at www.royalnavy.mod.uk/yeovilton-airday at the discounted advance rates (until 21 July) or by calling 08445 781 781. After months of research and preparation a new 36 page A5 colour booklet entitled, “Aviation Memorials in Nottinghamshire” has now been printed and free copies can be obtained from the Newark Air Museum. The booklet has been co-produced by the museum and the Nottinghamshire County Council, as part of the council’s Local Improvement Scheme grant programme. It provides an insight into the county’s diverse aviation heritage as represented by 40 aviation memorial sites in the county. Copies have been distributed to most Tourist / Visitor Information Centres and Libraries across the county; and work is underway to widen those distribution outlets. People can call in at the museum now to pick up a copy and as part of its commitment to the project the museum is willing to send off copies by post to people who request them. Such requests can be sent in via email to admin@newarkairmuseum.org or telephoned through on 01636 707170 (10.30am to 4.30pm daily). Enquirers are asked to provide postal addresses if they are requesting the printed version or a valid email addresses if they would like the PDF version. The Apache Attack Helicopter Display Team will be exploding onto the aerodrome this August Bank Holiday when they join the Wings & Wheels line-up on Saturday 23rd and Sunday 24th August at Dunsfold Aerodrome in, Guildford, Surrey. Whilst treating visitors to heart stopping acrobatic manoeuvres, the team will also be demonstrating the might of the helicopter’s fire power. In a series of simulated air to ground missile attacks using the aptly named Hellfire missiles, rockets and a 30mm chain gun, this display is not for the faint hearted as it culminates in fire balls and explosions! The Apache team performs manoeuvres in the helicopter, including high hovers, twists, pedal turns, wingovers and flypasts. 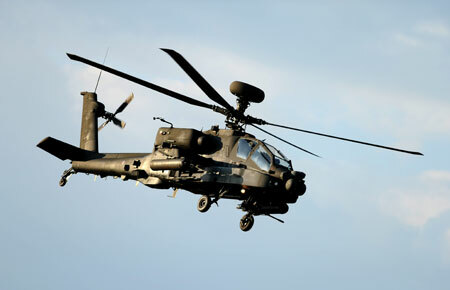 Drawn from a pool of suitably qualified and experienced, operationally ready, Apache aircrew and ground crew, the team is not on permanent assignment like other display teams and uses aircraft drawn from the operational Apache Squadrons. Visitors to Wings & Wheels can also enjoy the world famous Red Arrows, Battle of Britain Memorial Flight (Lancaster, Spitfire & Hurricane), Vulcan, Chinook, the Canadian Warplane Heritage Museum’s (CWHM) prized Avro Lancaster and a host of other modern and historic aircraft during the five hour flying displays. For four and two wheeled fans, supercars and classic and vintage icons put on an awe inspiring display of power and speed on the Top Gear track in a two hour auto spectacular from Brooklands Museum. On Saturday 28th June, events across the country will celebrate the contributions made by those who serve and have served in Her Majesty’s Armed Forces. The annual Armed Forces Day is an opportunity to reflect and pay tribute to our heroes past and present, including current serving personnel, service families, veterans and cadets. The Royal Air Force Museum Cosford will once again participate in this annual event by hosting veterans young and old from all three services. During this special reunion, hosted by Museum Staff, all Veterans will be treated to a full day’s programme. There will be free refreshments for guests, on arrival at 11.00am, followed by behind the scenes access to the Museum’s Conservation Centre and a talk from Darren Priday our Conservation Centre Manager about the Dornier Do17 Project. For lunch, veterans will have the rare opportunity of dining with other guests amongst the aircraft and artefacts on display in the Museum’s Hangar 1. A highlight for Armed Forces Day guests and visitors to the Museum will be a spectacular flypast from the Battle of Britain Memorial Flight Dakota, scheduled for 1:25pm (weather permitting). 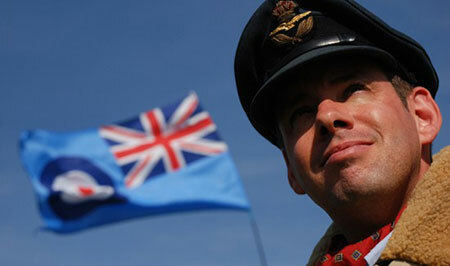 All-in-all this promises to be an exciting day which will enable Veterans to meet up with old friends, reminisce over shared experiences, and enjoy themselves in the authentic atmosphere and setting of the Royal Air Force Museum. The day will conclude at 2.30pm where guests are free to wander round the Museum. Attendance to the event is free of charge and by advance registration only. Any Veterans who would like to attend the event, are asked to book their place now by calling 01902 376 200 or for more information visit www.rafmuseum.org/cosford. In early May 2014 news emerged in the aviation world about the possible scrapping of Hawker Hunter T7, XL618, which was displayed at Caernarfon airfield in North Wales. Heather Graham of Lakes Lightnings made strenuous efforts to ensure that the airframe was not scrapped and then set about finding a suitable location to display the airframe. Following an approach to the trustees of the Newark Air Museum, an agreement was secured for Hawker Hunter T7, XL618 to be placed on long-term loan at the museum’s site in eastern Nottinghamshire, close to the border with Lincolnshire. 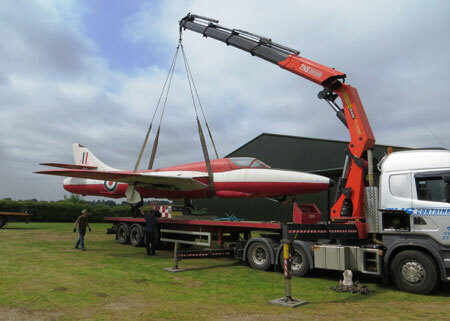 Hawker Hunter T7, XL618 was dismantled by a team provided by Lakes Lightnings and then moved to Newark Air Museum on the evening of Thursday 19th June, where it was reassembled the following day in an area on the museum’s Southfield Site. The Hunter T7 fits a gap in the museum’s themed display of RAF training airframes and will help tell the story of RAF fast jet training. Following a detailed condition survey, which will be completed jointly by Lakes Lightnings and Newark Air Museum, the airframe will be restored back to its former glory in as yet to be confirmed colour scheme. 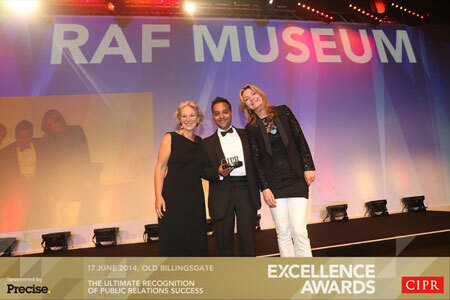 The Chartered Institute of Public Relations has awarded the RAF Museum an Excellence Award for its ‘Raising the Dornier’ campaign. The Awards Night, at London’s Old Billingsgate on Tuesday 17th June, saw approximately 800 guests gather to celebrate over 150 leading Public Relations consultancies, teams and individuals competing to win 30 prestigious CIPR Excellence Awards. The Museum won its award in the ‘Not-For-Profit’ category for the ‘Raising the Dornier’ campaign. Headed up by the Museum’s PR Manager – Ajay Srivastava, the Dornier story garnered front page coverage across the globe and included live broadcasts of the aircraft being lifted from the waters of the Dover Straits. 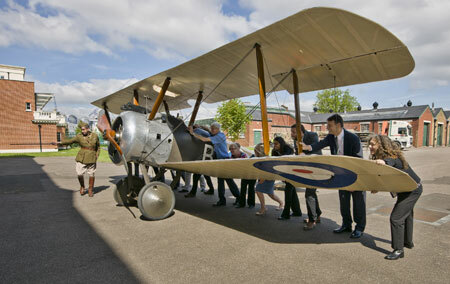 The Sopwith Camel is perhaps the most famous and iconic aircraft to take to the skies during the First World War. It was also made famous as the aircraft of choice by the fictional hero Biggles. This aircraft is to be exhibited in major new exhibition, opening in December 2014 which will allow museum audiences to discover and explore the unique and often overlooked role of air power during the First World War through the incredible stories of the men and women who took part. The exhibition ‘First World War In The Air’, was made possible with a grant of £898,558 from the Heritage Lottery Fund (HLF).